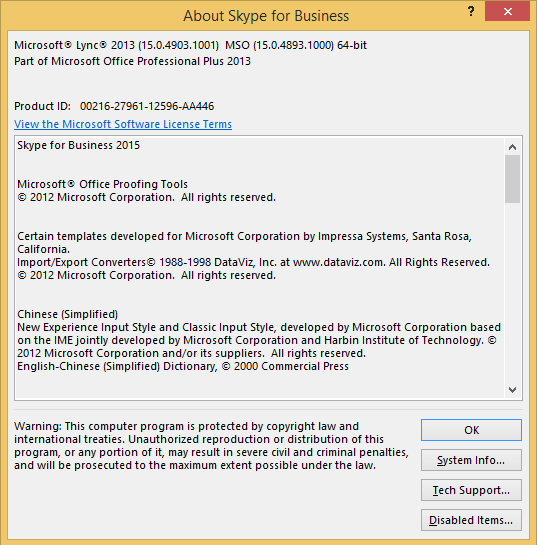 By my reading it’s been 5 months since our last security update to the Office 2013-based Lync/SfB client, and this one takes us from 15.0.4903.1001 to 15.0.4911.1000. It’s listed as Critical as there’s the risk of remote code execution. Kb 4013075 “This security update resolves vulnerabilities in the Microsoft Graphics Component on Microsoft Windows, Microsoft Office, Skype for Business, Silverlight and Microsoft Lync. These vulnerabilities could allow remote code execution if a user either visits a specially crafted website or opens a specially crafted document. 15th March 2017: This is the initial post. « Installing the Sonus "SWe Lite"